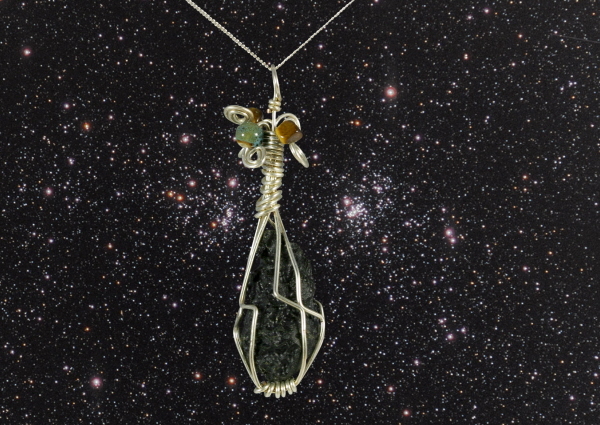 This is a superbly chunky pendant crafted from a teardrop shaped Guang Dong tektite strung from an 18 inch solid silver curb chain. If you aren't familiar with tektites it might be best to read up on the internet but they are thought to be a glassy, pitted substance created when a huge meteorite explosion hit Earth and melted tons of sand and rock -many thousands of years ago. The pendant has been skilfully wire-wrapped along with various beads - and has some intricate scrolling around the top of the pendant. NB - You will not receive this EXACT necklace, but one very similar in size and appearance. Much has been claimed about the mystical properties of tektite and we wouldn't start to claim any of these as fact, but when you know a little about what you are holding we can guarantee you will get a lifetime of pleasure from these strange and mysterious objects. This - along with the A4 meteorite information sheet I will also send you make up a fantastic gift package to give a fan of unusual jewellery or astronomy.